around the new General Data Protection Regulations (GDPR)due to come into effect by May next year. The headlines have mainly centred on the huge fines, that would just give Joe Public the opportunity to sue the Amazon’s of this world. 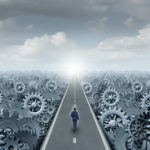 The truth is that every company in the UK will have to change their operations, in some way, to comply with new regime. If you hold personal data on any system (whether digital or paper) you will have to prove that you are being responsible stewards of the information in your care. Malcolm Ford of IT Enterprise Business Solutions will run a practical interactive workshop covering. Getting an action plan in place. Issues with different types of software. 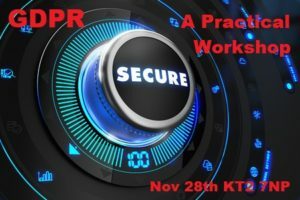 The seminar will give you the building blocks of how to approach the task of getting your documentation, procedure, and systems in to shape. Ultimately this should not be seen as yet another compliance with regulation, but as a chance for companies to get their house in order and to operate more efficiently with the information they have in their possession. This seminar will provide the participants with some of the tools they need to attempt this task. Richard Mullet: A lawyer and entrepreneur, Richard is passionate about facilitating growth for UK companies, creating value through exports and working with companies and partners in the UK and ASEAN markets to achieve this. Richard qualified with Slaughter and May in 1994 and spent 6 years advising blue chip clients, working on joint ventures and the IPOs of Orange, Energis and Colt. He was the lead lawyer on the largest global dual listing ever at the time, of RioTinto Zinc (RTZ) and CRA Mining (in Australia). Malcolm Ford has over 10 years’ experience in implementing Enterprise level software including data migration and reporting issues. He now is offering his knowledge to those who need to review their software in the light of dealing with GDPR. 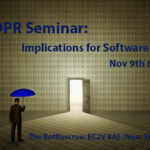 GDPR Seminar-Implications for software London 9th of November 6 pm.